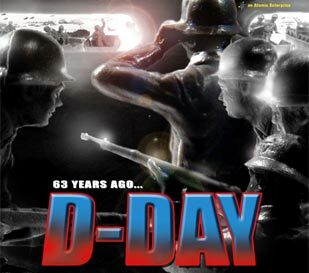 Here's complete coverage of one of the most coveted sets for World War II collectors - the Marx D-day set! Inside this issue you'll get the details on it's background, and some surprising disclosures on the contents of this invasion spectacular. Plus there's a mini-feature on a couple WWII landing craft by other makers, the Britains WWII figure line, 21st Century Normandy current production (this stuff is great and very reasonably priced) a new report of the reissue Western Town furniture hitting the market but BEWARE! A bag of these $18 items just sold on Ebay for $165 -- this is news you need to know! The Westcoaster Toy Soldier Show report is in, with photos, plus a Robin Hood puzzler, and lots of new, ads and information for the hobby. 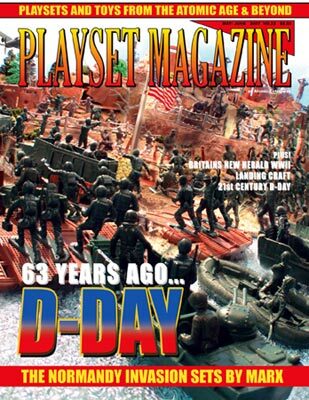 It's all here and more for some very entertaining and fun reading just for you in PLAYSET MAGAZINE.